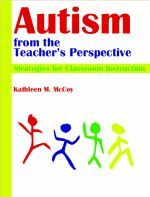 Autism from the Teacher’s Perspective provides a helpful and balanced perspective for teachers who provide services for children and youth with autism. This book is appropriate for any introductory course in autism at either the graduate or the undergraduate level. It also would be fitting for general and special educators, speech and language personnel, social workers, nurses, educational psychologists, and any service provider for individuals who fall on the autism spectrum.